Should the US Reform Interchange Fees on Credit Cards? 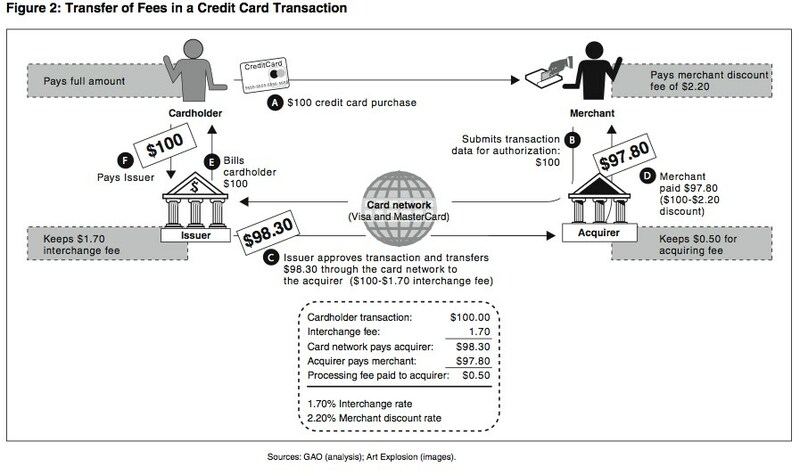 When a consumer uses a credit card to make a purchase, the merchant does not receive the full purchase amount because a certain portion of the sale is deducted and distributed among the merchant's financial institution, the financial institution that issued the card, and the card network that processes the transaction. The majority of this amount generally is called the interchange fee and goes to the financial institution that issued the card. As card use has become more popular, the costs for merchants of accepting them have been rising, and considerable debate has been occurring over these costs, and particularly the level of interchange fee rates. You charge $100 with a credit card. The store has a hypothetical contract with his bank that has a 2.20% merchant discount rate and the bank affiliated with your credit card has a 1.7% interchange fee. So your bank collects 1.7% of your charge, while the store's bank collects 2.2 - 1.7 = 0.5%. These numbers are reflective of domestic credit cards. The number of different categories a business could use have increased greatly since 1991. Visa went from 4 to 60, and Mastercard from 4 to 243. Critics argue that some of these increases in categories are to confuse and overwhelm merchants. But it makes sense that the credit card companies would need more specific and targeted categories over this time period since people are using credit cards for many more different types of purchases, including government, utilities, groceries, and online purchases, that they weren't using in 1991. As such, the credit card companies want a variety of options to be able to target the needs of a variety of businesses. Since so much more activity is online, and online purchases can be more risky, we don't necessarily want to be watching the average to see if it is increasing or decreasing. We want to watch the change within categories. We normally associate innovation with decreasing fees, costs and profits as an industry matures. From this chart, we can see within categories, around 44% of rates increased over time, with only 12% decreasing. What are the arguments for why this would increase? Sources from the credit card industry explained to me that the important thing to watch is the "effective rate" of all cards, which is the average in all cards, and that this hasn't changed over time. What's important to realize is that debit cards have less of a rate associated with them, and more people are switching to debit cards. However, as Felix Salmon noted, you can have the "effective rate" stay the same, or even fall, during a time period where all or some of the rates are increasing by having people switch to the lower rate. This is, in Steve Waldman's phrasing, a move from transactional and revolving credit, and that is a move that could benefit consumers who have trouble managing revolving debt. It is worthwhile to know that the credit card bill passed earlier this year doesn't cover debit cards, and it is possible that fees and traps there could increase faster to compensate for the changes to the credit card industry. Is it worthwhile to do anything about this situation? Critics like to point out that Australia recently capped interchange fees, and as one blog has summarized recent research, it "had the opposite effect of those that regulators were expecting. Retail prices are not lower. Instead, merchants enjoy stronger margins thanks to the lower cost of accepting cards." Indeed some industry insiders have spoken with skepticism on this situation, saying that the real benefiters from increased scrutiny in this area wouldn't be small businesses and consumers, but big box retailers. I think this reflects a poor conceptualization of the credit card process. The business is the consumer of financial services too. So to say consumers haven't benefited from interchange fee scrutiny because businesses enjoy better margins is wrong, as the business is precisely the consumer who has benefitted. In their conclusion, the GAO Report remains skeptical that the problem is so big, or that the government's tools are so strong, that action should be taken. They investigate the pros and cons of each of the following four options in detail in the appendix, and if the topic is of interest to you I'd recommend checking them out: (1) setting or limiting interchange fees, (2) requiring their disclosure to consumers, (3) prohibiting card networks from imposing rules on merchants that limit their ability to steer customers away from higher-cost cards, and (4) granting antitrust waivers to allow merchants and issuers to voluntarily negotiate rates. I want to focus on #2 - requiring their disclosure to consumers. Advocates propose that consumers deserve to know since they carry part of the cost, and that this would be a non-intrusive market mechanism-based approached that would have consumers express their preferences better. Critics say that the information would possibly confuse consumers, and that it would be too complicated for a cashier to clearly communicate the correct interchange fee for each specific transaction. This strikes me as one place where financial literacy could really do work here. Why not inform consumers of what is going on with interchange fees? They may ultimately not do anything about it; they may end up spending more as they'll realize they are subsidizing credit card users if they do not use a credit card, so they might as well join in. I would like to see a section of new financial literacy programs to include this topic. It goes undeveloped at Visa's new Financial Football page. The only mention is an old press release from the 2008 gas price market, noting "To help ease the pain at the pump, Visa recently capped the per-transaction interchange fee for Visa-branded consumer debit card purchases at $0.95 per transaction." (See this wonky take on that that translates.) Surprisingly for an educational site, it doesn't mention that, according to creditcards.com, competitor Mastercard took actions the previous year to cap interchange rates on gas prices as well. Some examples, say a grocer runs a $2m business with a 4% profit margin, 80% sales on credit cards with an X% fee, and the owner can't pass costs on to consumers. What's the owner's salary with a 0% fee and a 2% fee? ($80,000 and $33,600). What if the fee goes to 2.2%? (His salary goes to $31,680.) Or maybe an example I hear from small businesses, where someone charges a $1 newspaper with a credit card, and the business loses money. When we swipe our cards, banks and credit card companies swipe some of the money. People deserve to see the effects their decisions have on businesses, themselves, and the market economy itself. Mike Konczal is a fellow at the Roosevelt Institute.